Family Vacation Ideas – our family rates our Green River Trip the best ever! Our guides: Sam, Sarah and Spencer made this an unbelievable experience for both my children and us. 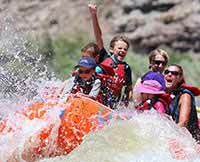 Our family rates this Green river rafting trip our best trip ever!